The ability to confuse audiences en masse may have first become obvious as a result of one of the most infamous mistakes in history. 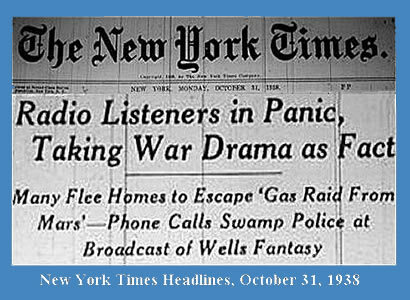 It happened the day before Halloween, on Oct. 30, 1938, when millions of Americans tuned in to a popular radio program that featured plays directed by, and often starring, Orson Welles. The performance that evening was an adaptation of the science fiction novel The War of the Worlds, about a Martian invasion of the earth. 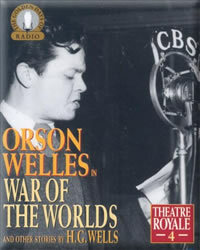 But in adapting the book for a radio play, Welles made an important change: under his direction the play was written and performed so it would sound like a news broadcast about an invasion from Mars, a technique that, presumably, was intended to heighten the dramatic effect. As the play unfolded, dance music was interrupted a number of times by fake news bulletins reporting that a "huge flaming object" had dropped on a farm near Grovers Mill, New Jersey. As members of the audience sat on the edge of their collective seat, actors playing news announcers, officials and other roles one would expect to hear in a news report, described the landing of an invasion force from Mars and the destruction of the United States. The broadcast also contained a number of explanations that it was all a radio play, but if members of the audience missed a brief explanation at the beginning, the next one didn't arrive until 40 minutes into the program. At one point in the broadcast, an actor in a studio, playing a newscaster in the field, described the emergence of one of the aliens from its spacecraft. "Good heavens, something's wriggling out of the shadow like a gray snake," he said, in an appropriately dramatic tone of voice. "Now it's another one, and another. They look like tentacles to me. There, I can see the thing's body. It's large as a bear and it glistens like wet leather. But that face. It...it's indescribable. I can hardly force myself to keep looking at it. The eyes are black and gleam like a serpent. The mouth is V-shaped with saliva dripping from its rimless lips that seem to quiver and pulsate....The thing is raising up. The crowd falls back. They've seen enough. This is the most extraordinary experience. I can't find words. I'm pulling this microphone with me as I talk. I'll have to stop the description until I've taken a new position. Hold on, will you please, I'll be back in a minute." As it listened to this simulation of a news broadcast, created with voice acting and sound effects, a portion of the audience concluded that it was hearing an actual news account of an invasion from Mars. People packed the roads, hid in cellars, loaded guns, even wrapped their heads in wet towels as protection from Martian poison gas, in an attempt to defend themselves against aliens, oblivious to the fact that they were acting out the role of the panic-stricken public that actually belonged in a radio play. Not unlike Stanislaw Lem's deluded populace, people were stuck in a kind of virtual world in which fiction was confused for fact. News of the panic (which was conveyed via genuine news reports) quickly generated a national scandal. There were calls, which never went anywhere, for government regulations of broadcasting to ensure that a similar incident wouldn't happen again. The victims were also subjected to ridicule, a reaction that can commonly be found, today, when people are taken in by simulations. A cartoon in the New York World-Telegram, for example, portrayed a character who confuses the simulations of the entertainment industry with reality. In one box, the character is shown trying to stick his hand into the radio to shake hands with Amos n' Andy. In another, he reports to a police officer that there is "Black magic!!! There's a little wooden man -- Charlie McCarthy -- and he's actually talking!" In a prescient column, in the New York Tribune, Dorothy Thompson foresaw that the broadcast revealed the way politicians could use the power of mass communications to create theatrical illusions, to manipulate the public. 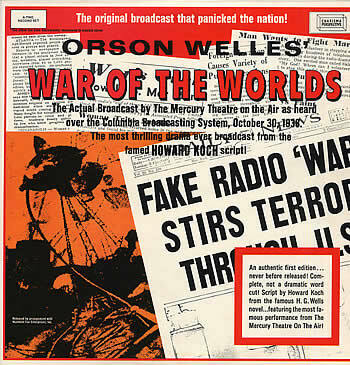 "All unwittingly, Mr. Orson Welles and the Mercury Theater of the Air have made one of the most fascinating and important demonstrations of all time," she wrote. "They have proved that a few effective voices, accompanied by sound effects, can convince masses of people of a totally unreasonable, completely fantastic proposition as to create a nation-wide panic. "Hitler managed to scare all of Europe to its knees a month ago, but he at least had an army and an air force to back up his shrieking words. "But Mr. Welles scared thousands into demoralization with nothing at all." In the 1950s, America had another taste of the power that simulations have, to draw people into a world of delusional fantasy, when paired with mass communications. This time it was revealed that a number of television game shows were simulations, in which contestants who knew the answers ahead of time were pretending to guess at their responses. But unlike the invasion from Mars, here the fakery was unambiguously intentional; it was the work of producers who had concluded they could create fictional game shows that would be more exciting than the real thing. Once again, there was a shocked reaction from the public. Once again, those involved became objects of public anger. And, as happened with the Orson Welles broadcast, an effort was made to ensure that such manipulations wouldn't recur. But in 1990, it happened again. Audiences around the world discovered that they were taken in by the ultimate Hollywood illusion in which two performers faked their own talent, lip-syncing, to create the impression they were singing. What millions of fans had believed were two talented singers was actually a composite, another seamless interweaving of sensory simulations in which two people provided the visuals, while vocalists provided the audio. As in the previous two instances, there was a stunned response. But unlike the experience of 1938 or even the 1950s, the social context was different because simulations had become commonplace, and attempts to use them to trick the public were the rule rather than the exception. Also by this time, a global culture had developed, which meant that tens of millions of people around the world were drawn into the same illusion. One might say that War of the Worlds and the game show scandal foreshadowed the age of simulation that was still to come. Allowing for a little poetic overstatement, the Milli Vanilli scandal served as a rite of passage or symbolic marker, making clear that we now live in an age of simulation confusion in which our tendency to mistake fakes for what they imitate has become one of the characteristic problems of the age. More to the point, we live in a time in which the ability to create deceptive simulations, especially for television, has become essential to the exercise of power. And the inability to see through these deceptions has become a form of powerlessness. Those who let themselves be taken in by the multiple deceptions of politics, news, advertising and public relations, are doomed, like the more gullible members of the radio audience in 1938, to play a role in other people's dramas, while mistakenly believing that they are reacting to something genuine.